All gifts will be collected automatically until May 8, 2020. 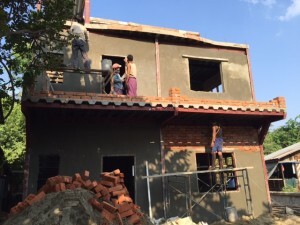 Would you help us build a ministry center in Yangon next to Pastor Naing Thang’s house? Our main project this year is to build a church in Yangon for Pastor Naing’s congregation, Foundation Church of Yangon and in the same building have dorms for the Bible School students and living space for several fatherless children. Year after year, Pastor Naing has pointed us to more urgent needs in Myanmar all the while needing a church building at the heart of the ministry. Caring for the children of the Rakhine Orphanage Center is a big part of his work too. It might be hard to understand, but it’s illegal for the church to meet in his home and also illegal for him to have orphans there too. Law dictates they have a separate building. Right now, Pastor Naing and his wife Mae Swei operate Reformation Theological Seminary out of their home we built in 2016. It’s very nice and serves many needs right now. Nearly a dozen female students are living there with his family, and we rent a nearby apartment for the young men attending and their headmaster. What we are planning to do is bring everyone and everything together. The new building would be a worship center for all of them and their church folks in Yangon as well as have plenty of space for dorms and study rooms for the Bible school as well as the children from Rakhine. We believe this project is vital to keeping the ministry moving forward and the advance of the Gospel going strong throughout Myanmar. Our overall goal for the project is $300,000.